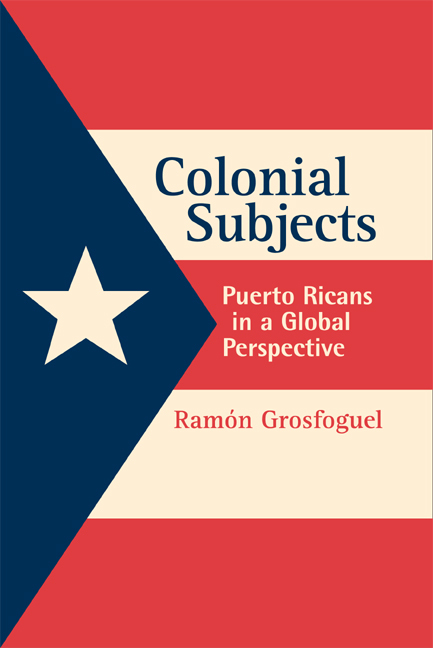 Colonial Subjects is the first book to use a combination of world-system and postcolonial approaches to compare Puerto Rican migration with Caribbean migration to both the United States and Western Europe. Ramón Grosfoguel provides an alternative reading of the world-system approach to Puerto Rico's history, political economy, and urbanization processes. He offers a comprehensive and well-reasoned framework for understanding the position of Puerto Rico in the Caribbean, the position of Puerto Ricans in the United States, and the position of colonial migrants compared to noncolonial migrants in the world system. Ramón Grosfoguel is Associate Professor of Ethnic Studies at the University of California, Berkeley, and coeditor of The Modern/Colonial/Capitalist World-System in the Twentieth Century (2002), Migration, Transnationalization, and Race in a Changing New York (2001), and Puerto Rican Jam: Rethinking Colonialism and Nationalism (1997). He is a research associate of the Maison des Science de l'Homme in Paris and the Fernand Braudel Center in New York.